Chalkboards are great for children's play or adults to-do lists. Here are a few chalkboard ideas from my files. A chalkboard canvas, as wall art, in your home is a great idea to entertain children, a great conversation piece while entertaining guests AND it's easy to take down and move into another room, if you desired. I love this!! Taken from Ohdeedoh. A chalkboard play table. 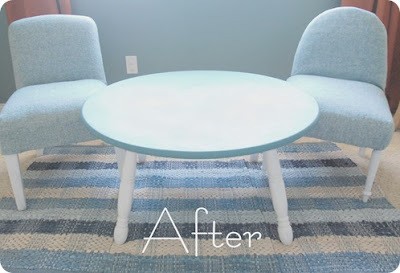 This amazing makeover features chalkboard paint on the table so you can draw on it! What kid wouldn't love to be "allowed" to draw on furniture? I'd love to do this DIY project for my daughter. See the before pictures as well as the how to HERE. Found via Design Dazzle. Kid's playzone. This is a great project for a child's room or play room. Get the know-how HERE. Taken from Ohdeedoh.